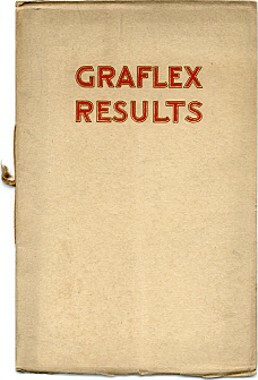 Graflex Results is a 31 page booklet by C. H. Claudy, Copyright 1908, Folmer & Schwing Division of the Eastman Kodak Company, Rochester NY. This promotional booklet is profusely illustrated with sample photographs across a wide range of subjects. The author describes how to best use Graflex cameras for pictorial, portrait, animal, child and sports photography. The operation of Graflex cameras is discussed in general. Lens choices include Bausch & Lomb Zeiss Tessar, Goerz, Isostigmar, Cooke, and Bausch & Lomb Zeiss Protar. The tan paper cover is oversized and so the edges are slightly worn. The title page has a 1/4 inch tear. There is a barely perceptible longitudinal crease. All else is clean, clear and legible. The original tan string binding is intact. The booklet is in generally excellent condition. Page size is 5 1/2 x 8 1/2 inches.